This is just a sampling of the places available in the Greater Bay Area. Please contact us and we can send you our complete listings. 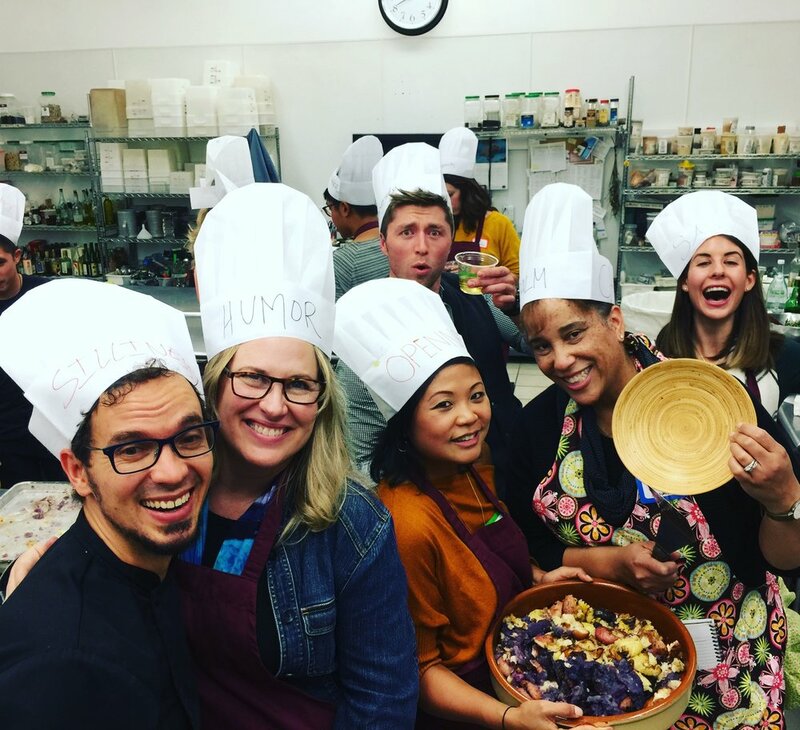 The Feastly Venues (Mission, Nob Hill, Russian Hill, Soma 20-80 guests): When you hire Sacred Kitchen, your private party can be hosted at one of the beautiful Feastly venues (usually requires 6-8 weeks notice). Chez Poulet (Mission, 60 guests seated, 35 chefs)- Great for groups of 50-60 with a fully functioning industrial kitchen. Naked Kitchen (Mission, 36 guests)-A gorgeous Victorian home in the Mission, perfect for your smaller event. Ferry Building (Embarcadero, 50 Chefs Max) - A lovely outdoor venue with heaters available and a beautiful kitchen. Eristavi Winery (Mission/Potrero Hill 20 Chefs, 80+attendees) - The Eristavi family combines European winemaking techniques with California grapes to offer superb wine in their intimate SF venue. Lia is an absolute joy to work with. No kitchen. The Laundry SF (Mission 20 Chefs, 80+attendees) Gorgeous converted industrial space. Art gallery, cafe and co-working space. No kitchen. Tell Sarah we sent you. Bently Reserve (Financial District, 40 Chefs Max) Inside the Old Mint. Grace Street Catering (North Oakland 60 Chefs Max)- A hidden gem in Oakland. Ask about discounts for booking at our Sacred Kitchen home. Orinda Country Club (Orinda 100 Chefs Max) – Limited availability. We are confident that we could host your event at your office space or hotel/resort property provided the following is available: enough space, access to sinks, proper ventilation/ability to cook indoors or access to an outdoor area with electricity if possible. If you would like to host your event at a hotel or resort property please let us know ASAP so we may first contact the venue to determine space and amenity considerations.